No recipes for today but definitely some yummy food to talk about! On our way back through the rain to the metro station we came across a magnificent market set up on Grey Street. At first we thought, blargh it's raining let's discuss coming back tomorrow but then we saw it, the Holland stall complete with stroopwafels. 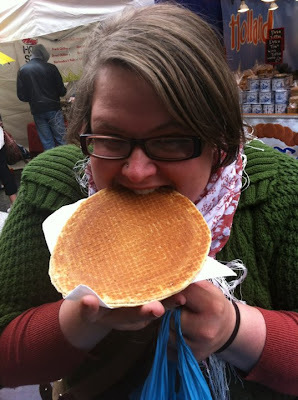 But then we saw the GIGANTIC stroopwafels being made on the spot with warm treacle being spread between the two scrummy waffles slices. We had to try one! It was delicious!!! It's as big as my head!!! Fingers crossed the weather is better tomorrow because the foodie stalls didn't stop there! We also saw a paella stall and a Caribbean food stall! Also, the EAT! Newcastle Gateshead Festival is about to begin! I can't wait to eat up some of these events! http://www.eatnewcastlegateshead.com/ . If anyone is interested in going to ANY of these events! Please please let me know, would love to come along!